A large alcoholic drinks manufacturer here has launched a marijuana flavored liquor, the company said Friday. 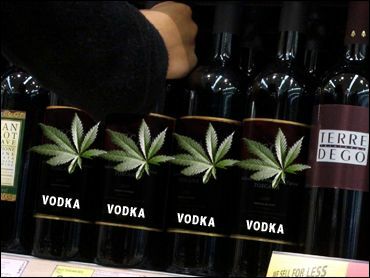 The drink does not contain any tetrahydrocannabinol (THC) — the active substance in marijuana — but does have an alcohol level of 16 percent, Jiri Janak, the head of liquor production at Drinks Union, told The Associated Press. "We produce it from hemp, but there's no THC in it," Janak said, adding he has received no complaints from anti-drug activists. He said the flavored vodka is sold mostly in large supermarket chains and in some restaurants. A one-pint bottle sells for about $3.20.